When I was a kid I spent a lot of time with my neighbors, Ernie and Linda Bontrager, and their girls, Alicia and Kristin. They were like a second family for me, and many of my homemaking skills were learned from Linda. I remember watching Linda pack extravagant picnics for dinner at the Hollywood Bowl—I was usually the babysitter for such events. The food that woman could get into a picnic basket was nothing short of gourmet, and place settings always made for, what I’m sure, was a very romantic evening. I also remember when Linda would suddenly decide that some Cockeyed Cake was in order—an easy, quick cake that’s all made and baked in one pan. She’d whip it up in minutes, bake it and serve it with vanilla ice cream while it was still warm. 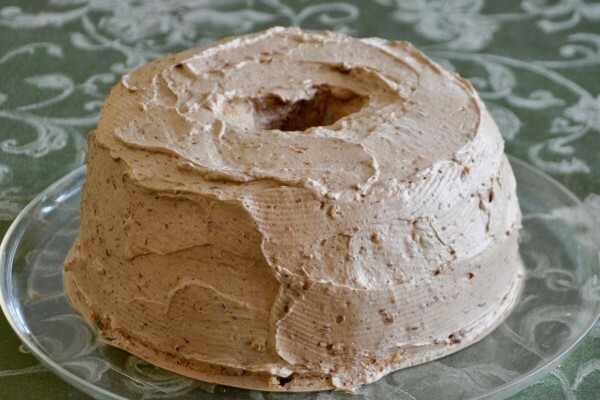 But lately, I’ve been thinking about, and craving Linda’s Angel Food cake. It’s super easy to make. Sunday night we had Paul, Erin, and the kids down for dinner. Our granddaughter Amelia isn’t terribly fond of cake—which I can’t possibly begin to understand—but she will eat angel food. So, I figured this would be a good time to make little piece of heaven. And, it was a hit. All that said, I thought I should probably share the recipe with you, because seriously, I’ve never known anyone else who makes this cake, and that’s just sad. So, without further ado . . . here’s the secret of ANGEL FOOD DELICIOUSNESS. Start by making (or buying) an angel food cake. I used a box mix, but feel free to make yours from scratch, if you’re a purist. In my opinion, however, that just requires way to many egg whites—and too much time. Whip cream to form stiff peaks. Fold the melted chocolate into the whipped cream. Liberally frost the top of the bottom layer and place the top layer back on the cake. Liberally frost the top, sides, and center of the angel food cake. That’s it unless you’re like me and now need to wipe the spills and crumbs away from the bottom to make the cake platter look pretty. I suggest a dry paper towel (or two, or three) for that job. Now, here’s the tricky part. You need to get this sweetness into the refrigerator to set for a few hours before serving. (It required some major rearranging on my part to get it to fit—kind of like getting the turkey into the refrigerator to thaw at Thanksgiving. I have a cake platter with a cover that I use, but if you’re going to finish it off that night, it might be okay without the cover. This is about the easiest cake you’ll ever make, with the possible exception of cockeyed cake. And, I found the link to that recipe here. Sounds delicious and I’m going to have to make this real soon! Thanks for sharing. I would be delighted to share in angel food cake and sit on your porch! What an inviting story you tell! It would be a joy to have you come visit my porch!